How to get rid of taweez properly. Q0006:As salamu alaykum brother, how do I get rid of taweez? Do I have to be a specialist of some sort? You do not have to be a specialist of any sort you just have taqwa of Allah and protect yourself. Whosoever fears the Creator Allah, everything in the creation fears him (the slave of Allah). If you want to dispose of the taweez, it is better for a male, member of the family who is practicing to dispose of it. 4. Pour the water into an ice cream tub or container. 5. Now you can begin to remove the item from its locket, leather case etc. 6. Make sure you collect everything- including the case, sting, wax and keep it all to soak together in ruqya water. 7. As your opening the taweez read last two quls and blow on it. Most taweez will be covered in a plastic wrapper, or sellotape. Take it out carefully. Untie the knots in the string or cut them. 8. Read the last two surahs of the Quran on the taweez and then blow on the taweez. 10. Once you have taken out the taweez from the packet, or locket, or wax sealed case, etc... don't waste time reading it and studying it, look at it briefly or take a picture (if you must) then say bismillah and tear it up. 11. 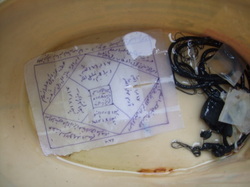 Put EVERYTHING into the ruqya water- the thread, strings, paper, plastic, wax, metal, every last bit of the taweez. Making sure it is completely submerged. 13. Place the container away from your house, maybe in a bin or somewhere it won't cause any problems or littering. Note: Do not burn the paper or content of a taweez if it has a waxy layer on that paper or if the paper looks like its got oil on it. Please note the method may vary from what has been mentioned above but the effects of invalidating the sihr will be the same inshaAllah.